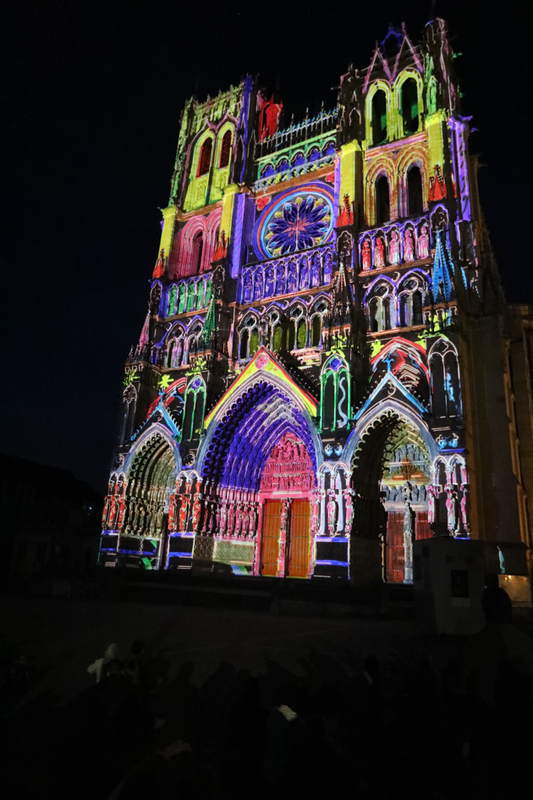 (Above) Sound and Light Show, Amiens Cathedral. 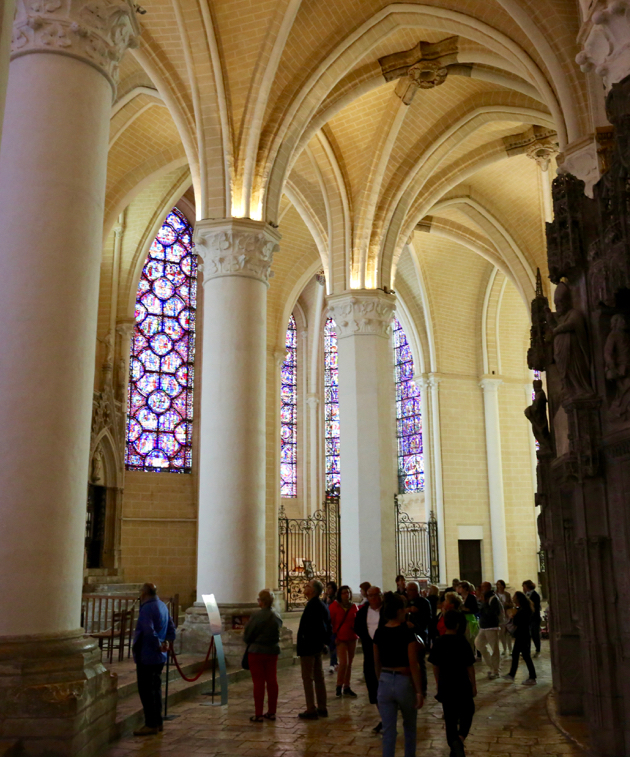 Let me share some thoughts and impressions from a recent excursion to the cathedral towns of Northern and central France. But I do not intend to describe here what are indisputably the most perfect examples of Christian architecture ever created. Likewise, this is not the place to talk about the medieval Church and society that created them. Rather, I wanted to say a few words about what we saw of the world of today: the contemporary Church of France and its presence in the modern society. 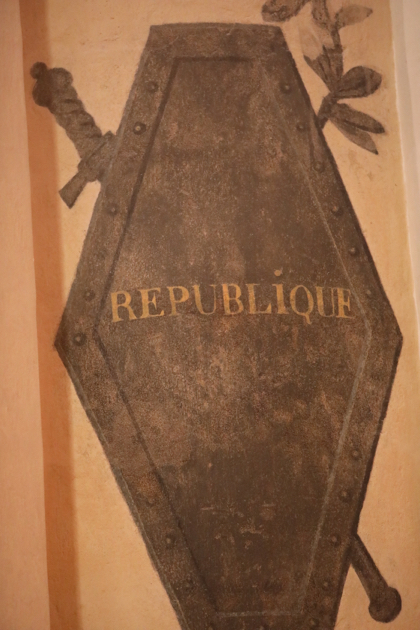 On the whole the Church in France today presents an image of desolation. In the cathedrals we visited there were hardly more than handful of worshippers outside of mass times. And other than in Chartres there were not many more tourists. A large percentage of the visitors to places like Amiens were focused more on the area’s World War I battlefields amid the 100th anniversary of some of the most terrible battles of that struggle. 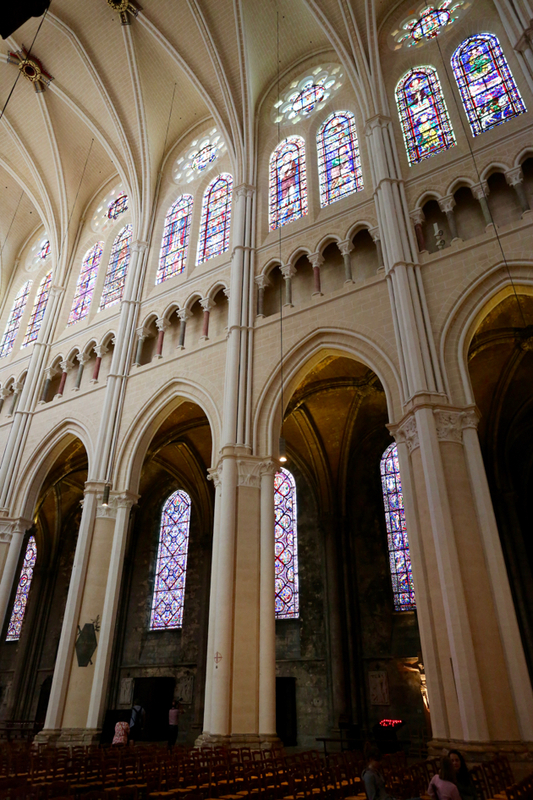 Only Chartres, within easy striking distance of Paris, attracts a considerable – if not overwhelming – crowd. In some cathedrals we could not find any posted mass times. 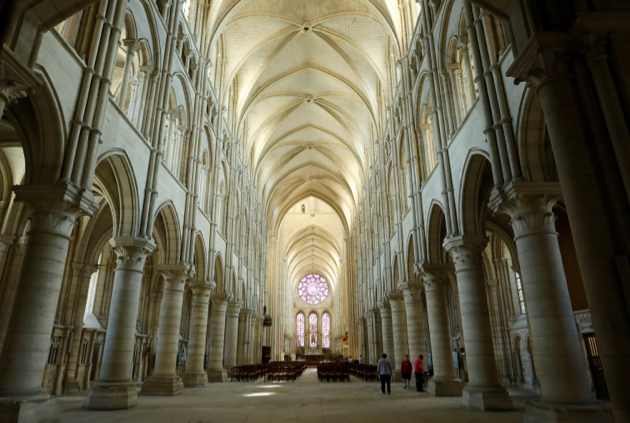 The early cathedral of Laon, virtually deserted, towers in splendid isolation over its medieval town and far above the beautiful countryside. The pilgrimage church of Notre Dame de Liesse sits forlorn and quiet in a small rural town of the same name. At times the visitor feels like a witness to a long dead and departed people and faith, just as when he is confronted by Paestum or Angkor Wat. As in the case of some ancient monument, one sometimes needs to speculate as to the exact time this or that church arose – or was destroyed. We can only be grateful for state ownership, which is undoubtedly the reason these monuments remain relatively intact, in generally good condition and open to the public. (Above) Laon cathedral. 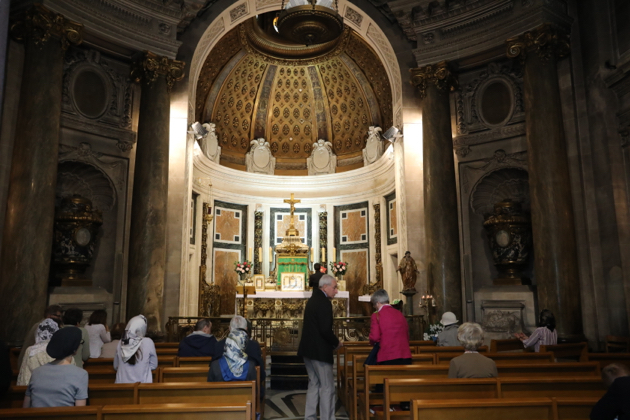 Including the photographer and one woman (not visible here) in the chapel of the Blessed Sacrament, at this time there were a total of 7 people in this grand church (except for the woman, all tourists). 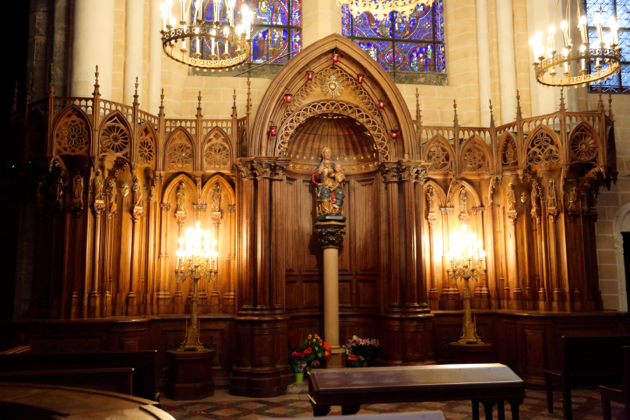 In Chartres the chapel of the Blessed Sacrament is a pathetic affair with an electric light burning before it. Only a couple of worshippers pray here. 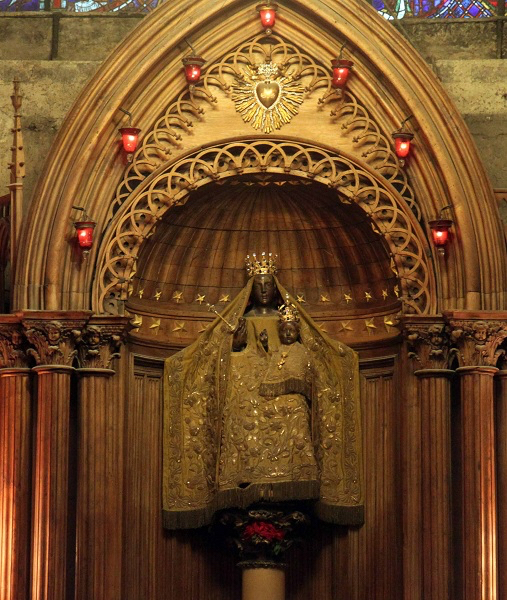 Not many more kneel before the image of Our Lady – a “black Madonna” until it was drastically cleaned and “restored.” I seem to recall that as recently as 5 years ago there were so many more people kneeling before this shrine, which was also surrounded by banks of burning candles. 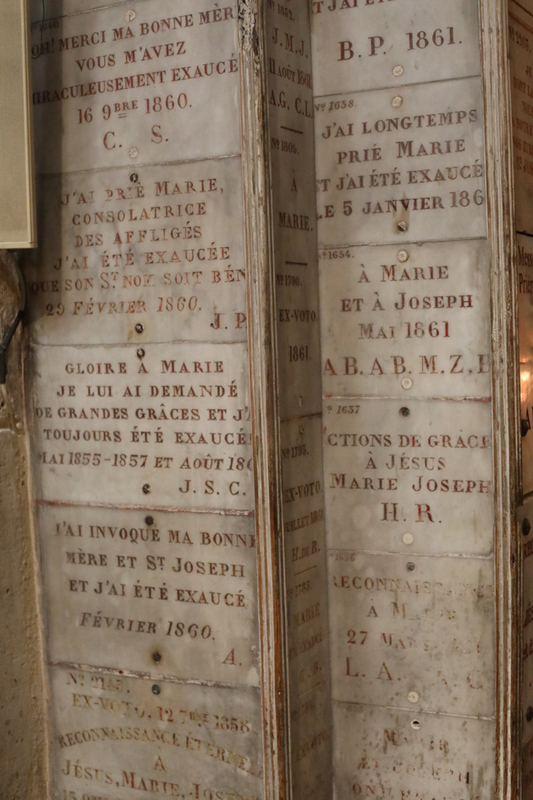 By the way, here, as in other French churches the traditional long tapers – the ones you stick on a spike – have largely been replaced with “American” votive lights. But not, thank God, the half-size ones of the New York Archdiocese. 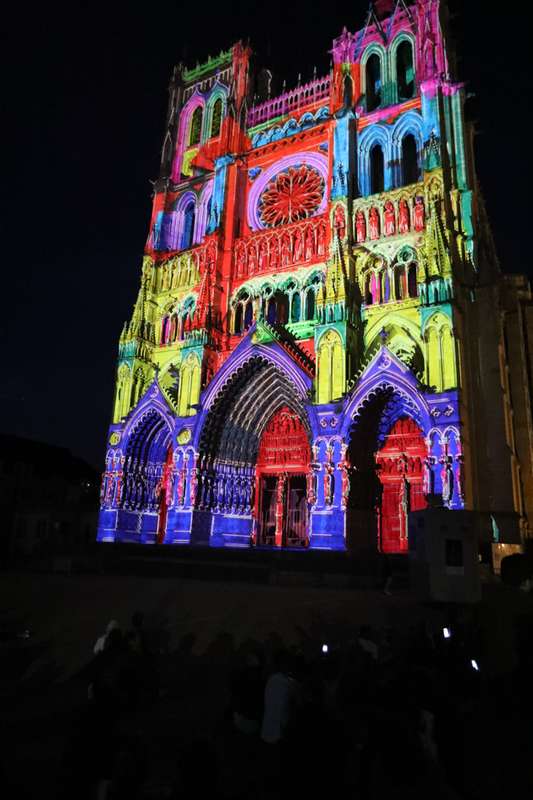 Sound and light shows utilizing the facades of (above) Amiens and (below) Chartres cathedrals. (Above) Restorations? 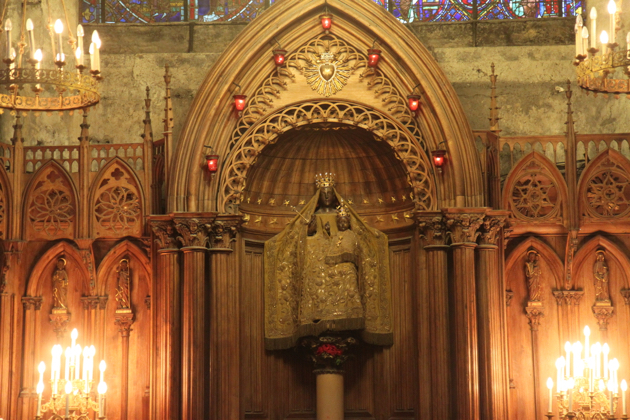 The “Black Madonna” of Chartres in 2012;(Below) the same statue in July 2017. The same is true of other aspects of Catholicism. Many do not realize that these grand churches often owed their magnificence to their precious relics they contained. Today these are as a rule totally neglected. 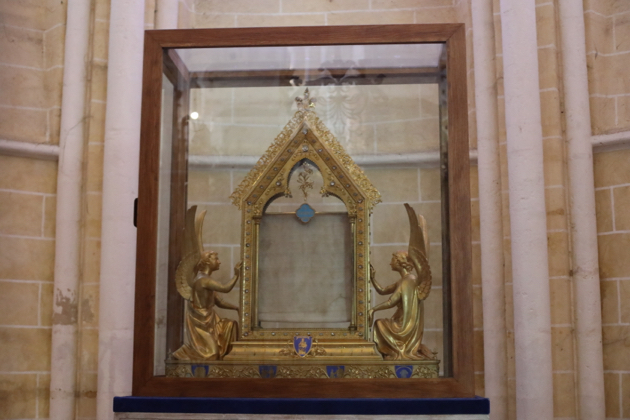 What is left of the “veil” or “chemise” of the Virgin Mary, once the pride of Chartres, is now exhibited a not very prominent side chapel. 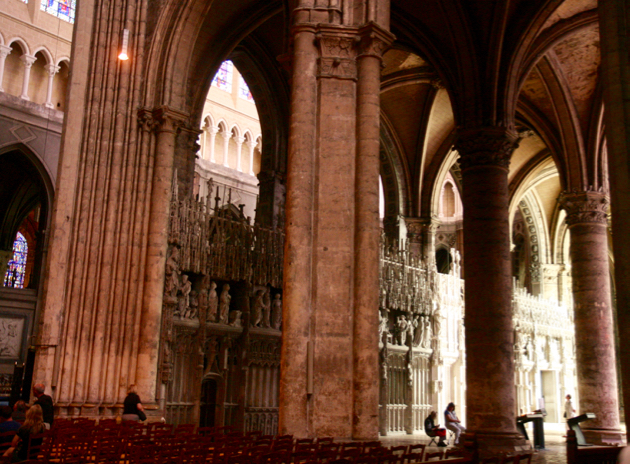 The grand cathedral of Amiens partially owes its origins to its acquisition of the head of John the Baptist from Constantinople. 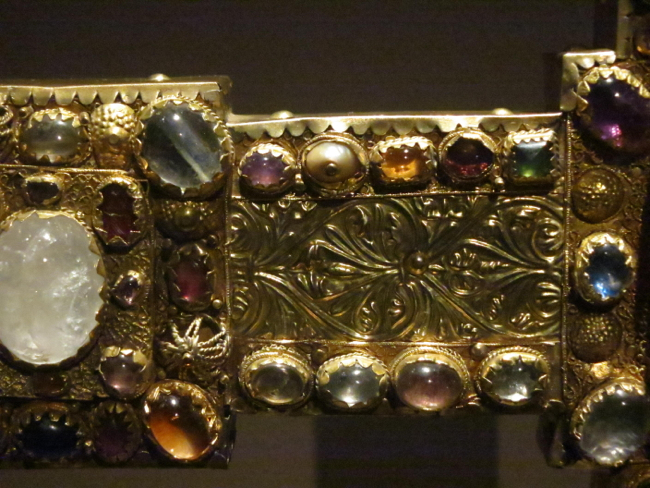 That relic now can be seen only in a tour of the cathedral treasury. The (secular) guide informs us that all recent tests have indicated that the head belonged to a man living around the time of St John in that part of Palestine – but these findings obviously haven’t produced a new influx of pilgrims. 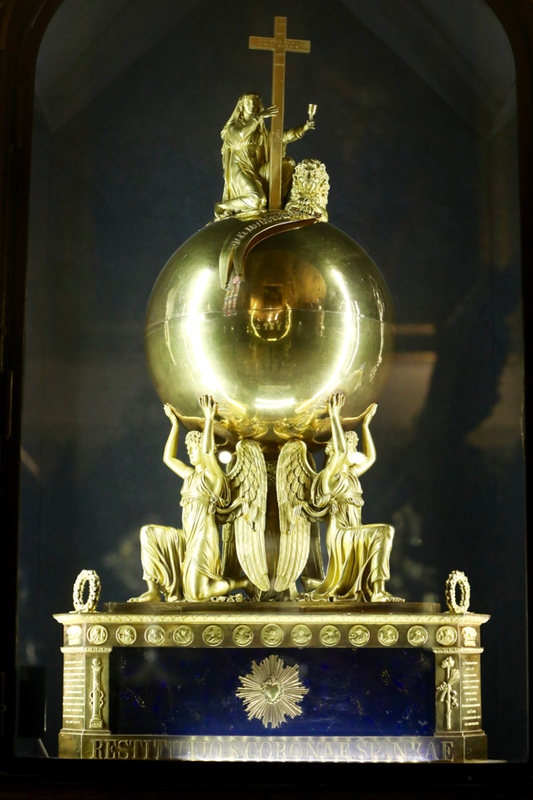 (above) A reliquary at Notre Dame de Paris created under Napoleon for the crown of thorns, after its predecessor was destroyed in the Revolution. It is no longer used as a reliquary for the crown of thorns, which now can be viewed in a modernistic shrine in the cathedral. The involvement of the non-, even anti-Christian French state in Catholic affairs of course has not always been beneficial, now or in the past. At every step one still encounters the ravages of the French revolution: razed churches and cathedrals, smashed statues, burned relics. 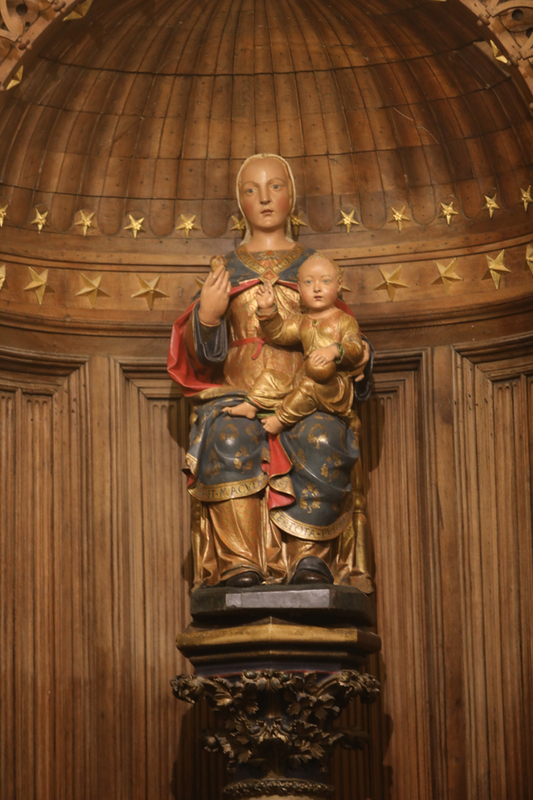 The pilgrimage statue of Notre Dame de Liesse is actually only a copy containing ashes of the original, burned by the revolutionaries. 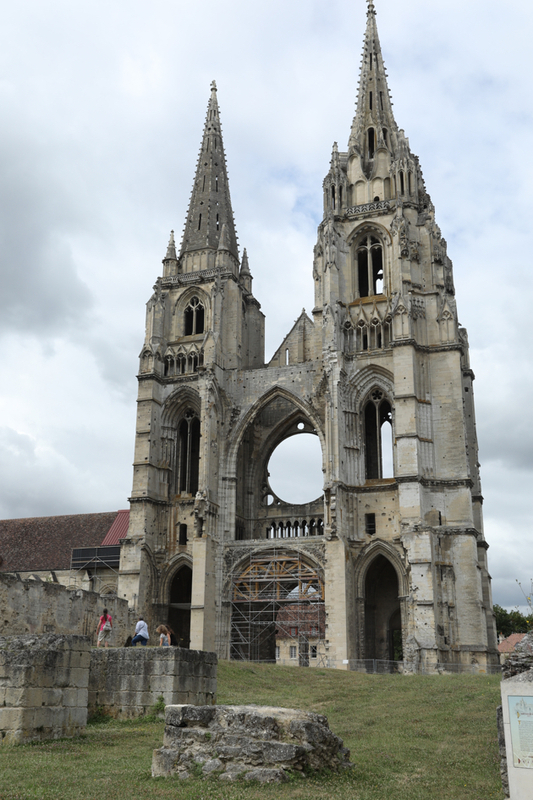 The relics of St Stephen at Bourges and the famous ”druidic” Madonna and child of Chartres were utterly destroyed. Chartres, however, did recover a least a part of the Veil of Our Lady. (Above) A revolutionary painting, recently discovered in the course of the Chartres restoration. It (like its sister “Constitution”)dates from the time the cathedral had been converted into a “temple of reason.” Later it was painted over. More recently, state-sponsored vandalism has taken the form of excessive restorations. Chartres has been the main victim. We have talked about the former Black Madonna. 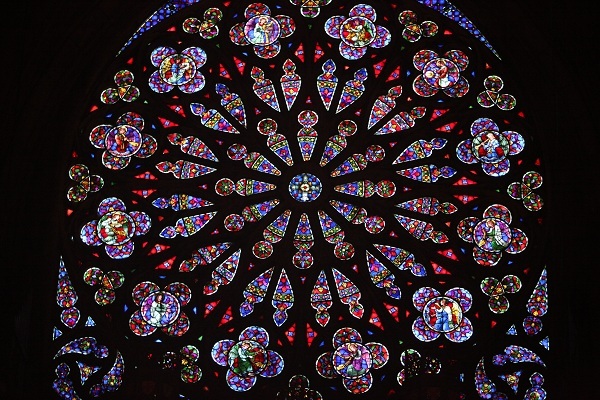 That had been preceded by a not uncontroversial cleaning of the stained glass windows. Currently, there is a campaign to give the interior a bright white finish. At a minimum, we can say that aesthetically this is not a total success. 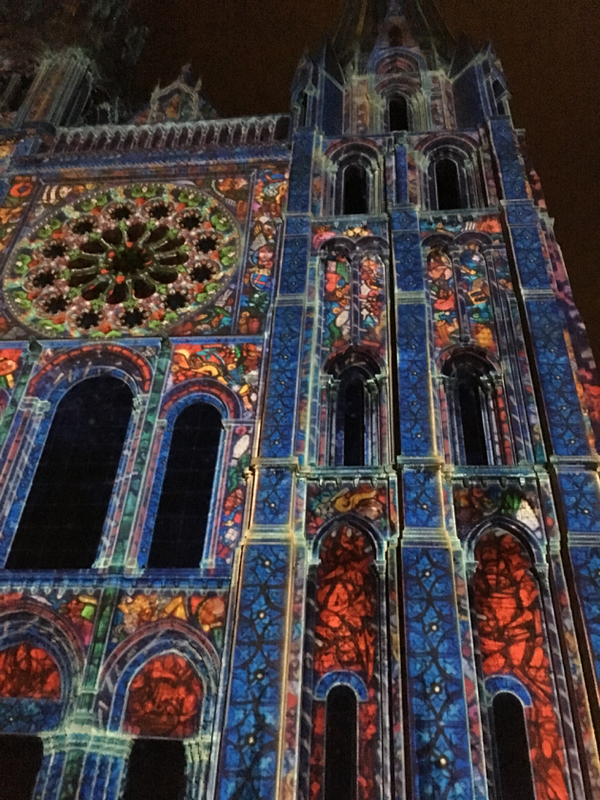 1) Finally, the less said about the use of cathedral facades for sound-and-light shows, the better. (above) The “restored” ambulatory and (below) nave (both July 2017). 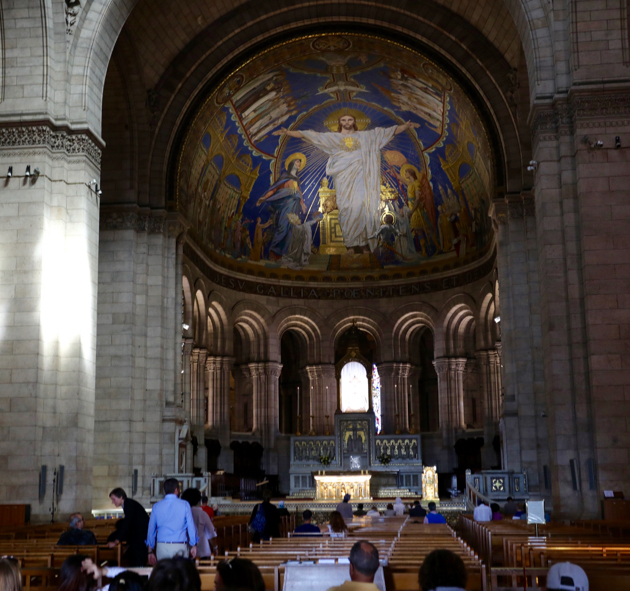 The practice of the Faith is livelier in Paris. Is it because Paris, having pioneered the exodus from the Faith from the 18th Century onward, ”bottomed out” decades ago and is now surpassed in irreligion by regions that have more recently jumped on the secularist bandwagon?? Or is it due to the greater number of foreigners and tourists in the capital? 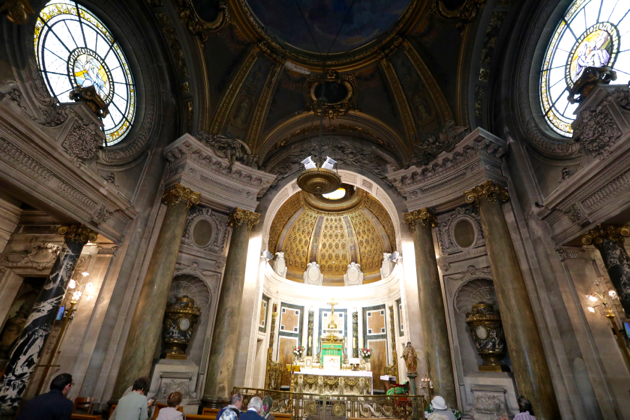 The devotions in the chapel of the Miraculous Medal in the Rue du Bac still draw multitudes. We have to mention, however, that the majority of the clergy and up to half the congregation were African. 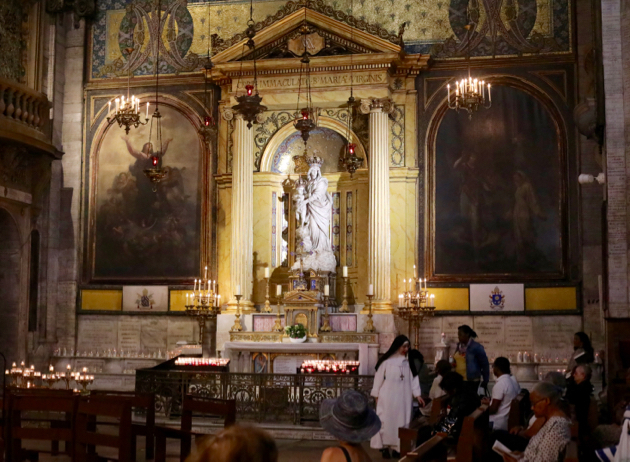 You also still can find a fair number praying before the statue of Our Lady in the church of Notre Dame des Victoires, known for the innumerable marble ex-votos covering every available surface commemorating Our Lady’s miraculous intercession. Sacré-Cœur indeed may be a tourist meccca (how appropriate an expression these days! ), but like St. Patrick’s in New York City, it attracts the faithful as well. Moreover, there is exposition of the Blessed Sacrament, and the presence of sisters in full habit. 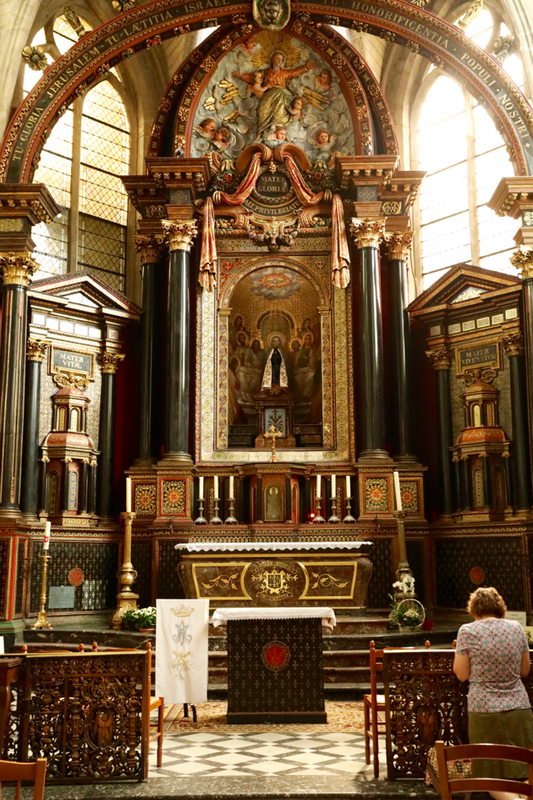 And one thing that Paris does do well – in contrast to New York and everywhere else: almost every church has a manned welcome desk for those who have spiritual questions or needs. (Above) Notre Dame des Victoires. And what of the masses? 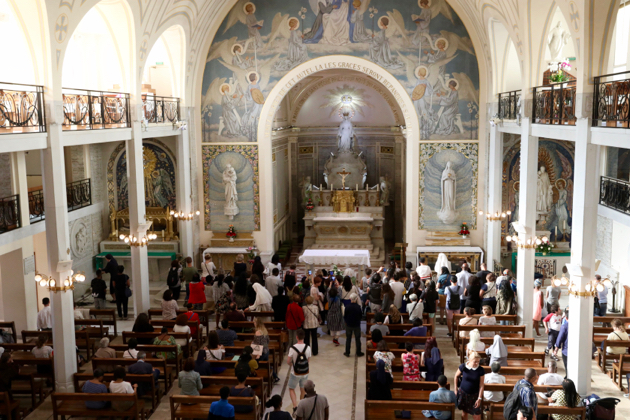 A Novus Ordo Latin mass was celebrated in Chartres Sunday morning. The altar of course is one of those pathetic blocks that here, as elsewhere, has been inserted in the transept of the cathedrals. Yet ceremonial and music were dignified despite various errors and the difficulties of what appeared to be a rather aged volunteer schola. I’d estimate some 70-100 people were in the congregation, which like the schola and the celebrant, were largely of an older generation. 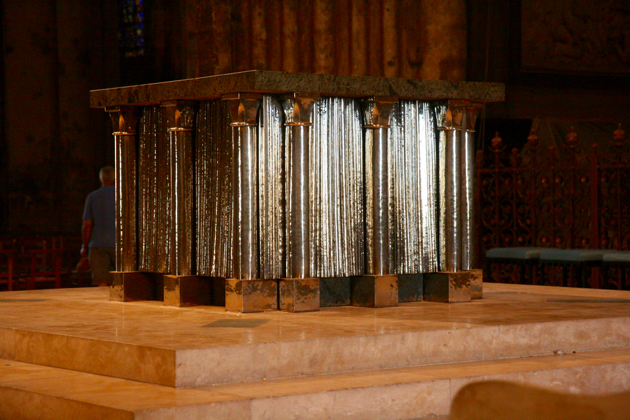 (Above) the “Novus Ordo” altar of Chartres Cathedral. (Above and Below) Notre Dame de Consolation (after the mass). 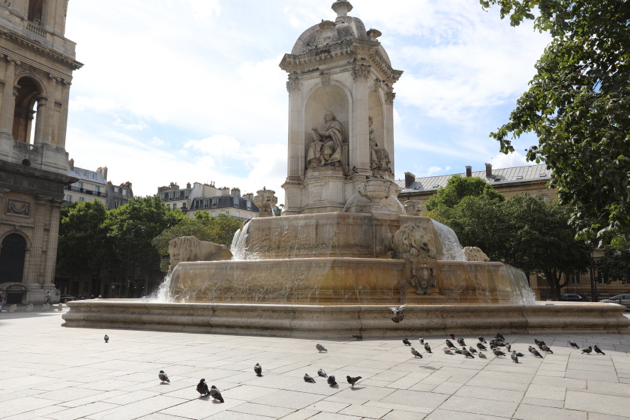 (Above) A fountain before St. Sulpice:four greats of the 17th-18th century French church. 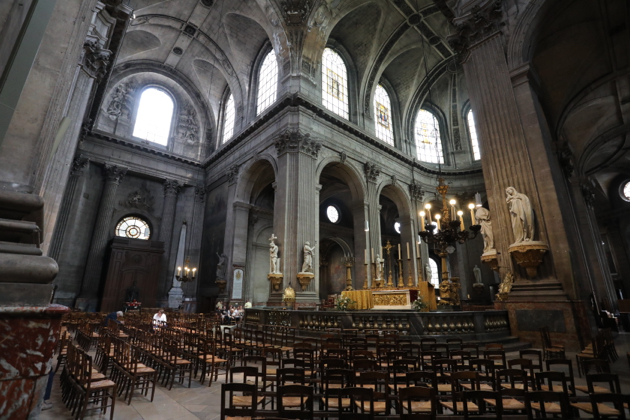 (Below) St. Sulpice. Nowadays the 17th – 18th century church has to take pains to refute claims of occult links by Dan Brown (it features prominently in one of his novels). The parish bulletin also expresses the hope that those who come to hear the organ might consider participating in the liturgy as well. The following Sunday we first attended mass at Notre Dame de Consolation, an elaborate neo-baroque chapel commemorating a terrible fire in the 1890’s. In recent years the association that owns it assigned it to the FSSPX. Thing seem to be going well – a mass that the 2015 parish website described as taking place in the basement chapel is now upstairs with music. A much younger congregation than usual in this part of the world filled the smallish church. Even a ”crying room” was utilized! 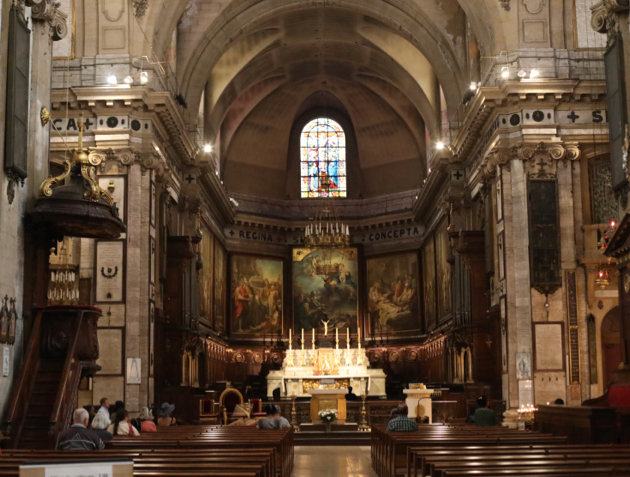 Finally, later that morning we attended mass again at St. Sulpice, nowadays, the second largest church in Paris. A congregation of 200-300 was in attendance – although many if not most were present for the organ concert that follows the main service. The mass hardly reached the level of your average US suburban parish, complete with a tone-deaf ‘leader of Song’ flailing her arms. The contrast of the Novus Ordo service with the music of organ – one of the finest in the entire world – was shattering. Admittedly, there were a remarkable number of concelebrants at this mass – then it turned out 4 or 5 were from the New York Archdiocese…. Ramm, Benjamin, “Which Past Should We Preserve?” (The New York Times, September 2, 2017 at C1). 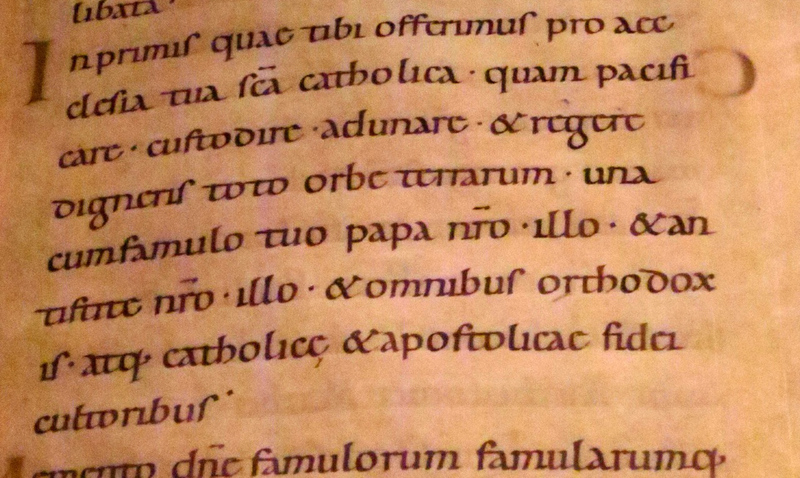 This article on the Chartres restorations coincidently appeared today. The author very perceptively points out that that while the columns, wall and ceiling are “restored” the floor and the lower parts of the columns remain in their original state bearing the marks of 800 years of wear.